Getting Rooted In New Zealand is a diary of a California girl’s introduction to a completely different life experience in a new country and never has the phrase ‘stranger in a strange land’ been more relevant than in reading her intriguing and often insightful diary entries! Her observations about both culture and language are a wonderful mix of observation about one person’s reaction to the differences that make up the wonderful human race and the minutiae of daily living. I’ll be looking forward to seeing if Jamie produces another book about her experiences of coming to live in the UK. My life is literally an open book, but Jamie Baywood is a pen name. Getting Rooted in New Zealand is based on my real life experiences living in New Zealand 2010-2011. 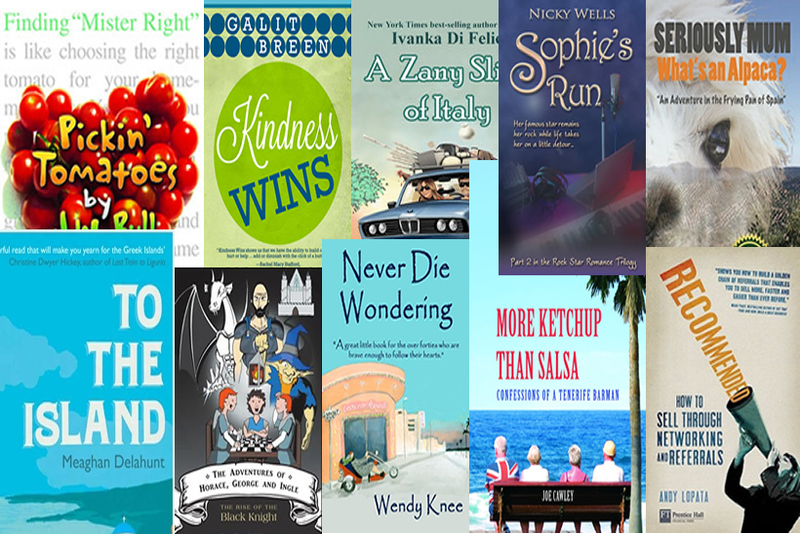 I haven’t told my family that I’ve written or published a book. They think I’m just living in the UK working on a MA in Design studying book covers. The one thing that most people don’t know about me is that I am an author. Writing helps me stay sane. I consider myself an accidental author. 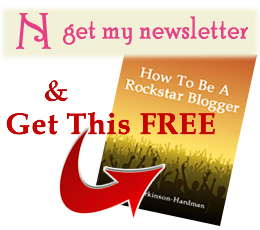 I kept finding myself in unbelievable bizarre situations that I had difficulty processing. I wrote them down and shared them with other to verify I wasn’t losing my mind that these things were really happening. In New Zealand, I wrote and performed a monologue based on my real experiences contained in the book. After the show I talked to members of the audience that didn’t believe my story was true. It would be great if someone like Zooey Deschanel or Alexis Bledel played me. I would hate it if Kristen Stewart played me. Yes. I’m originally from California and lived in Samoa and New Zealand before I moved to the UK. Sometimes in my previous climates it was just too hot to wear anything. The hardest adjustment to moving to the UK is the amount of clothes you have to wear even inside. I am still in complete denial that I’m no longer in a tropical environment. I never had a proper winter coat before I moved to the UK. I only wear dresses never trousers. I still only wear summer dresses I bought in Samoa and New Zealand that I just put my huge UK coat over with a hat and scarf. Eat, Pray, Love. I consider Elizabeth Gilbert a role model, not just for writing, but life. In my book I wrote that I took Eat, Pray, Love too literally like an instruction manual for my own leap of faith. Jamie’s book is only available in paperback format and she is very kindly giving away a free, signed copy to one lucky commenter. All you need to do to be in with a chance of reading it is leave a comment for her at the end of this interview. 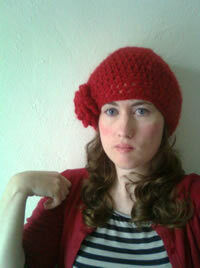 Where can you find out more about Jamie and buy her book? 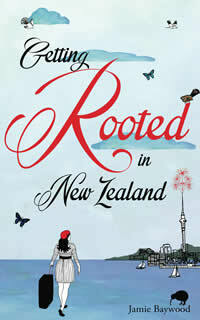 Getting Rooted in New Zealand is available in Kindle format from Amazon.com and Amazon.co.uk. Love the cover, the story, the background and everything but… educate me! What does ‘rooted’ mean in Enza speak?? I’m thinking weird random things here, that can’t be right?? Great feature, thanks, Linda! Thank you very much! I designed my book cover myself. The girl with the suitcase is a drawing of me. The birds are New Zealand native birds like the kiwi and fan tail. The city is Auckland and the tower is New Zealand’s Skytower. The sky in the back ground and the water are pieces of a watercolor painting I did of the New Zealand coastline. To answer your question, ‘rooted’ has a different meaning in New Zealand than it does in California. I was oblivious of the other definition for months in New Zealand. The title it is another way of laughing at myself. J. K. Rowling and I both used to live in Edinburgh. I used to lived in the Grassmarket on West Port in Edinburgh; the door to my building was between two used bookshops – Peter Bell Books and Armchair Books. Living in Edinburgh, I could totally see how J. K. Rowling’s Harry Potter books were inspired by the magical city of Edinburgh. I am pretty sure I lived in the flat above the bookshop where Harry bought his school supplies. I am rather enjoying leading a double life. So far it has been the easiest secret to keep. I am living in a different country from my family and my husband’s family so that aids the author secret. I have a few relatives on both sides of the family having babies this year, so both sets of families are mostly talking about the imminent arrivals and not questioning what I am doing. It’s just such a soul-baring book, it’s literally my diary. In many ways it is easier to tell strangers my story. I know they would be proud of me, but for now it’s nice to have the privacy from my family about the book. All my relatives and in-laws don’t need to know extremely personal details about my life that are in the book. good for you – living overseas is akin to being in a bubble where many of the things you assumed are viewed anew. My daughters have benefited from their over-seas stay, one in France, one in Germany. My secret plan is for my wife and I to live in New Zealand for six months of the year after I retire. I highly recommend that you and your wife go to New Zealand as soon as possible and stay as long as possible. You’ll love it! That’s wonderful that your daughters both lived overseas – it sounds like they both learned other languages as well which is amazing. Great giveaway by the way. I too spent a little while living in New Zealand and I’d love to read about Jamie’s adventures in the country. That’s wonderful that you lived in New Zealand as well. Where did you live? Do you ever think about going back? Where do you live now? I hope my adventures in New Zealand make you laugh! I think I would really enjoy this book. I’m a Canadian living in Lancashire UK and reading someone else’s experience of this country would be great! And the winner is … Zarina. Congratulations and I’m sure your book will be winging it’s way to you very shortly.